What Day Of The Week Was January 13? 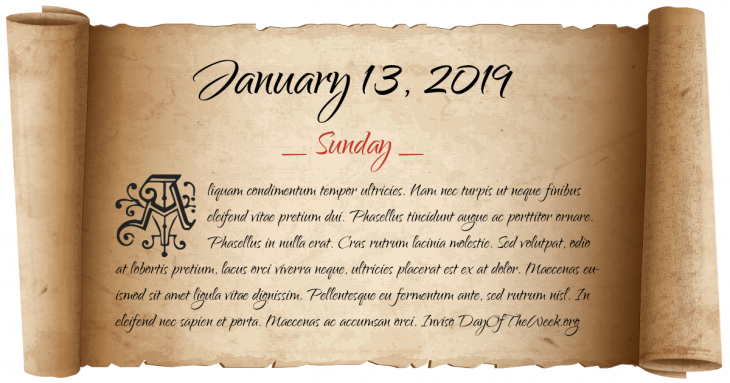 January 13, 2019 was the 13th day of the year 2019 in the Gregorian calendar. There were 352 days remaining until the end of the year. The day of the week was Sunday. It is still celebrated as New Year’s Eve (at least in the 20th & 21st centuries) by countries still using the thirteen-day-slower Julian calendar (Old New Year). French Revolutionary Wars: A naval battle between a French ship of the line and two British frigates off the coast of Brittany ends with the French vessel running ashore, resulting in the death of over 900. National convention of black leaders meets in Washington D.C.
Emile Zola’s J'accuse exposes the Dreyfus affair. Space Shuttle program: Endeavour heads for space for the third time as STS-54 launches from the Kennedy Space Center. Who were born on January 13?